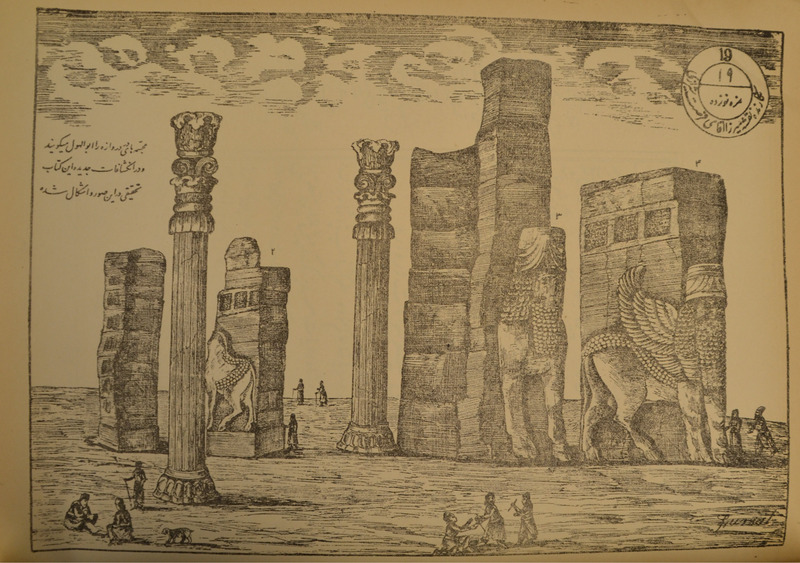 Lithograph #25 from the Asar-i ajam depicting the Apadana palace at Persepolis. The Persian caption reads: “These are carvings at the base of the structure called the Hall of Forty Pillars, built by Xerxes.” For a modern photograph of the lion and bull section of the relief depicted above see here. Fursat, the author of the volume, was born in 1854, and as a young man was something of a polymath. He was among the first Persian scholars to take a serious interest in the language and history of ancient Persia. He even learned cuneiform. He learned painting from a Shiraz artist trained in Europe. 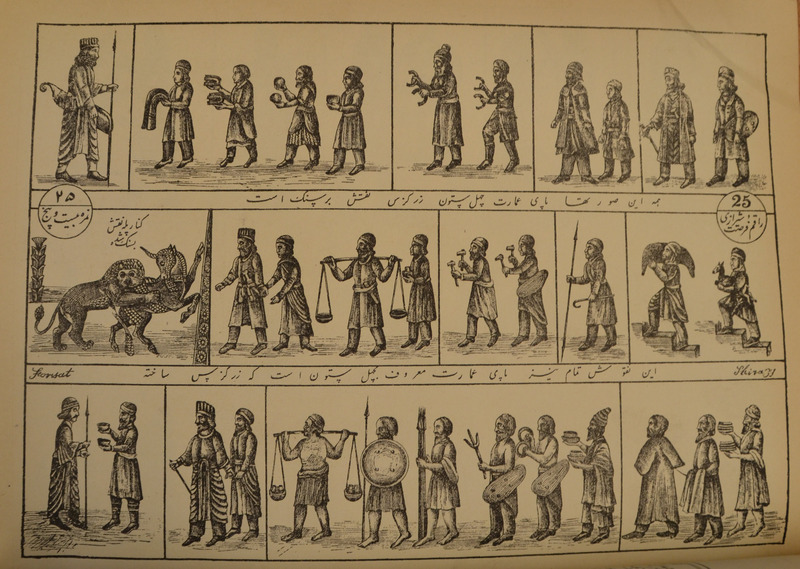 Fursat even did all of the original illustrations for “Asar-i ajam” from which the lithographs are made. Fursat’s signature in roman characters from one of the Asar-i ajam lithographs. Later in life his love for representational art led him to learn photography, and he became quite accomplished at it. He was also a well-regarded poet, writing in Persian and Arabic, and he makes frequent allusions to Pre-Islamic Persia in his work. For a time, he was appointed as director of the Shiraz branch of the Department of Education. He was especially concerned with arranging for the education of nomadic children. He never received any compensation for his services. Instead he had to use his personal resources to pay for any expenses. Before long he was appointed head of the newly created Department of Justice, and he gave up his position in the Department of Education to concentrate on his new post. Twice in 1910 and 1916 when factional warfare broke out in Shiraz, he acted as an intermediary and a peace-maker. Fursat died in 1920 of chronic kidney and stomach illness. “Asar-i ajam” remains his best known work. It has been reprinted several times, in 1935 and 1983, but the Penn Libraries own the original printing. David Giovacchini is the Middle East Studies Librarian at the Penn Libraries. ,Volume 1 (1972), p. 291. Willem Floor, “Art (Naqqashi) and Artists (Naqqashan) in Qajar Persia,” In Muqarnas: An Annual on the Visual Culture of the Islamic World, XVI (1999), p. 148. This biographical sketch drawn largely from Manouchehr Kasheff’s entry on Forsat in the Encyclopedia Iranica Online.